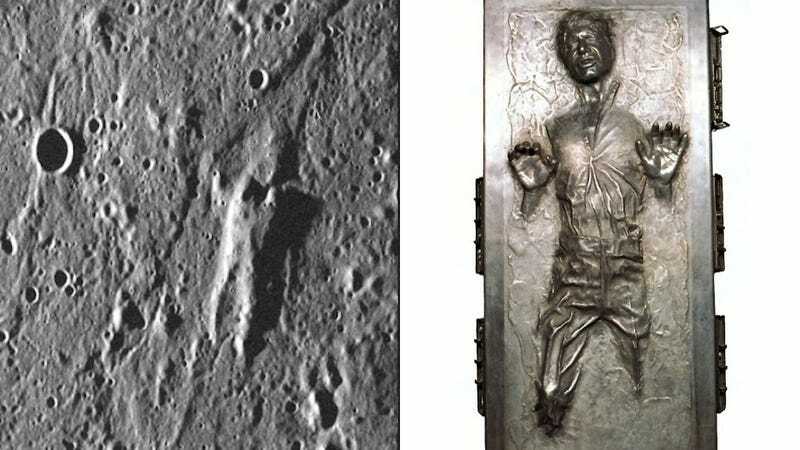 Not at all long ago, in our galaxy just two planets away, NASA's Messenger probe discovered what appears to be a raised human shape in the surface of Mercury—and it bears a striking resemblance to Star Wars' Han Solo. A portion of the terrain surrounding the northern margin of the Caloris basin hosts an elevated block in the shape of a certain carbonite-encased smuggler who can make the Kessel Run in less than 12 parsecs. If there are two things you should remember, it's not to cross a Hutt, and that Mercury's surface can throw up all kinds of surprises. This block may be part of the original surface that pre-dates the formation of Caloris, which was shaped by material ejected during the basin-forming event.